Into the dark of space and time. Into the winter's icy flowing. The children have had a wonderful time this term with visiting performers and visits to different performances. Firstly our Portuguese troubadours, then Taffy the story teller and now yesterday’s trip into town to see the story of the ‘The Fisherman and his Wife’ performed by folks with strong Waldorf connections. What a delight! The children are so fortunate to be able to experience so many talented and richly diverse performers. Is proving to be highly successful, the food is wonderful, nutritious and filling. Thank you to all the chefs in the kitchen from all the full and satisfied tummies. Unfortunately we do not have enough children to begin Ring-a-Rosie in term two as we had hoped. We thank those who have expressed an interest and would encourage you to sustain that interest for the beginning of term 3. The teachers have been working hard this term on Policy review. We hope to have many revamped or renewed policies available on the website at the beginning of term 2. Policies are a vital element in creating school culture and it is important that everyone has an understanding of the underlying principles and values that we all hopefully subscribe to. I hope you take the time to peruse them once they are online and maybe even take the time to comment. Policies lie behind the ethos of the school and designed to provide clarity about who we are and how we do things. Fundamentally, they should support everyone in their journey through the school. Parents need to advise teachers (particularly Prep parents) who will be picking their child up in the afternoon. Heather will have a book outside the classroom that parents will need to sign if someone other than the parent/guardian is picking up the child that afternoon. Also it is important from a safety perspective for parents who pick children up from our Early Years program to keep the littlies close to you when going to pick-up older siblings. Please note our festival is next week, starting at 9.15am. I expect that it will finish around 10.45-11.00 am. I look forward to seeing you all there. Thank you for a lovely term. It has been a delight getting to know your children. Here we have Emrys telling some of the kindergarten children a story. They were all so attentive and he was a magnificent story teller!! With the rain and some cooler weather we are now beginning our day with inside play. It was a bit exciting initially but we are settling into our new rhythm. In some ways the term seems to have gone by quickly but when I look at the children I see so much change since the beginning of the year. We are looking forward to our Autumn Festival next Thursday, the last day of term. Please refer to your invitation for details and note the starting time of 9am. This week, Class 1 have encountered Jake the giant. Jake loves to blow down the chimney of an old tower in an abandoned garden, behind a hedge. The only thing is, he blows way too hard and makes such a terrible, terrible noise. He ends up learning to blow gently by practising with dandelion seed puffs and sending the fairies off to the ball in their little carriages. 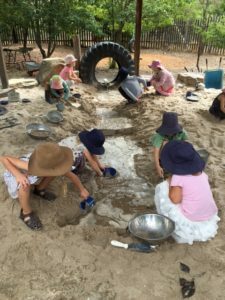 Engineering in the sand pit is still one of many activities that make recesses a lot of fun. From underground ‘water pipes’ (the hose) forming a shower at the end, to finding at least nine Banjo frogs has been the highlight of lunch plays for many class members. We are also looking after the kindergarten chooks and they get a lot of love and attention at recesses too. Thank you to all Parents who participated in our Class Meeting on Monday – very valuable support for the positive education of our children. Class 2 are very enthusiastic about our learning of number patterns and times tables and particularly playing Number Bingo! We look forward to seeing the performance of ‘The Fisherman and His Wife” at the Castlemaine Festival this week and some Harvest and Easter activities to finish the term, with the beginnings of Autumn on the way for us to enjoy during our holidays. We started the term with the Creation story from Genesis and were inspired to paint the seven days of creation and with accompanying text, have created our “In the Beginning” books. Stories from the Hebrew Old Testament told us of the plight of the first human beings and their beginnings on the earth after their expulsion from the Garden of Paradise. For the Class Three child these stories mirror the it own inner journey and the themes and challenges that the nine year old change brings. A lovely addition to our program this term has been Cooking on Fridays lead by Renata and parent helpers. Our excursion to Werribee Zoo with Class Four was a great opportunity to see and study animals that we are now drawing and hearing about in the story of Noah and the Ark. As part of our Measurement main lesson, last week we measured out in cubits the length of the Ark and were surprised to see what an enormous vessel it was. As our first term concludes I would like to thank Renata, Rose and Cassia for their help and support with cooking and accompanying us on our excursions this term. I mentioned at our Class Meeting last week that we will meet early next term and discuss further plans and projects to support our class during this period of change and challenges. We have sadly said “Goodbye” to the epic story of the Kalevala and we have moved on to our local area and mapping. I hope you all have a wonderful end of term and enjoy the Autumn Easter break. Our journey through Ancient India has now included a wonderful singing and chanting session with Wendy Rowlands who brought along some of her Indian instruments for us to sing with. Jeff Onans has also come and shared his memories of visiting India and of his time with Indian elephants and their mahuts (elephant keepers). Thank you both very much. We have attempted to create an India in the sandpit, learnt a Shiva dance that is done to recorder and drums and we are now exploring fractions through the Ramayana and Mahabharata stories. Some Indian feasting is also on the menu. Regular Olympic practice is continuing with long jumps, wrestling, relays and sprints being worked upon. As we enter the last week of Term 1, we look back and realize that we have put a lot of effort into our working; improving our handwriting, number skills, spelling, reading, writing, sports skills, Spanish, craft, painting, singing and strings playing. A holiday is well deserved and we look forward to coming back to Formal Geometry, Zarathustra and Ancient Egypt and decimals. May you all have a wonderful last week of school and enjoy the holiday break. To be sliding along the water. When you reach your destination you think how lucky you were…. As you look back along the River all your dreams come before you. 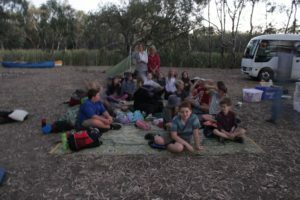 On Tuesday, the fourteenth of March, Class 6 students set off with Lisa, Kerrie, Chloe and John on an expedition aiming to follow the Loddon River towards the Loddon Plains near Boort and then canoe down Serpentine Creek before it returns to the Loddon River. 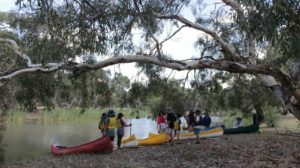 We travelled by bus and truck towing our kitchen trailer and canoes into the Dja Dja Warrung country north west of Bendigo. I t was great having Kerrie and Chloe as they were both part of a project to set up a Canoe Trail down Serpentine Creek when they were in their final year as Outdoor Ed. Students at La Trobe University. They were good guides and taught us canoeing and safety rules we would need along the way. Seeing a range of wildlife from an owlet Nightjar, Whistling Kites, Spoonbills, ducks, white necked Herons, a Boobook owl and a lone water rat (Rakali) grooming itself in the morning sun. The Rakali were hunted during the early days by white men because they were fetching good prices in Fashion Houses in London where they were used as water proof coats, collars and hats. Star gazing and sleeping under the stars. We saw the Southern Cross, the saucepan, the seven sisters and the two smudges of the Emu’s head as told by the Boorung people in their stories about the stars. Learning about the land, plants and heritage from the times of the original custodians from a local historian and conservation worker who later had dinner with us. He told us a lot about how he came to dedicate his life to learning about and caring for nature when he was a young man in Vietnam. He also told us about aboriginal cooking mounds (middens) and showed us rocks used as tools by the indigenous people including a green stone axe from Mt William and heat beads they used in baking ovens. On the third day paddling some of us saw a platypus! Meeting a third generation farmer of 5,000 acres at Fernihurst Estate who showed us remnant native vegetation fenced off from the rabbit plague last century, his family burial ground and his shearing shed. He liked going into the shed because it reminded him of the money he has been making from selling fine merino wool to overseas fashion houses. ‘We learnt a lot about travelling together and from other people who placed their hope and trust in us to continue looking after the land and all that live in it.’ Anon. We have had a wonderful term! We work hard, have loads of fun, complete some glorious work and sing!! We look forward to another terrific term, with our Rock Climbing Camp as another highlight in Week 2!! Incroyable! Unbelievably we have already reached the end of the term. Our Class Six students have been very busy with excursions and camps but they have already shown great progress in French … particularly in their mastery of our ongoing French quiz game – escargots et grenouilles. Our escargots (snails) have made a valiant effort to catch up with the grenouilles (frogs) but so far our champions are ahead by leaps and bounds (yes, that’s a French pun). Hopefully next term we will add vital new general knowledge to our class quiz and les escargots may yet take the lead! In Class 7/8 students have put the finishing touches to their unit of work on King Louis XIV and the Palace of Versailles, rounding out their exploration of this topic with a look at the magnificent gardens of Versailles and comparing their daily routine to that of Louis. We all appear to be in agreement that selling tickets to as many as sixty members of the public who wanted to watch the King sleep may not have been much fun! Finally we have one more story session in the library this term (1.15 – 1.45 Tuesdays). Our last story will be Vif Comme Un Grillon – for all those children who might be ‘lively as a cricket’ … and we may even have time for a game of French bingo! It has been a somewhat interrupted start to our PE lessons this term, with many public holidays, school events and camps taking place. But what a privilege it was to experience all things Portuguese throughout the wonderful Multicultural Week! Our cricket program is moving ahead well and is being well received by the children. We have been working on our fielding and batting over the last few weeks and recently moved on to the various aspects and techniques involved with bowling. The rain today will put a slight halt on our plans, but it is nice for the earth to receive a well needed drink. Only one more weeks to go before our term break, how time flies! I wish you all a wonderful break and hope all families have an enjoyable Easter spent with loved ones. Active April is a Victorian Government Initiative encouraging people of all ages, particularly school aged children, to commit to 30 minutes of physical activity every day throughout April. As our term break falls throughout the majority of April, I encourage all families to take initiative and head to the website https://www.activeapril.vic.gov.au to register your interest. There are many great prizes and benefits from doing so, most of all, the improvement in health and wellbeing from being physically active. Challenge yourself and you won’t regret it! Good luck! With one more week remaining, many busy hands are trying to complete their projects. Many projects, however, will not be completed by the holidays, and that is alright. Sometimes we put too much pressure on ourselves and I try to avoid this in the children. Their work will be completed at the right time without haste. The children love craft generally, and are highly motivated, so it is hard at times to rein them in, and work at a steady pace. If your child brings homework home during the holidays, it suggests that they are not quite working at a steady pace, but somewhat slower. Their work requires working on over the holiday, please support them. Monday, 27 March will be our final school lunch for the term. Sujeeva is planning frittata with a light pasta salad. A tofu version will be available for those who don’t eat eggs. Dessert is looking like something special too. We won’t send out any more order forms, but you can drop a note to the office if you haven’t already ordered or you can text me on 0420 318 255. Thank you to Rob at Harvest for supplying our produce and to Salonika and Aleesha who donated the nashis and the apples we turned into last week’s crumble. Thank you also to those who’ve helped with the cooking, delivering and dishwashing. We have had a lovely time with the lunches. Thank you for allowing us to experiment and have a bit of fun with it. Some children told us that last week was the first lentil burger they had tried and the vegan aioli made from aquafaba was a revelation. We’ll let you know how much money we’ve raised early next term. 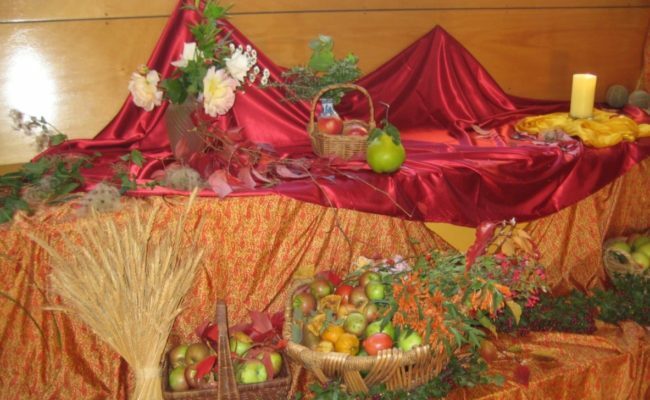 Our Autumn Harvest Bush Dance is on Saturday, 29 April which is early next term. Mark the date on your calendar now if you’d like a fun, relaxed evening dancing with your children and friends. This year we are enormously privileged to have the Centenary Bush Band featuring Jane Thompson and James Rigby playing and calling for us. Jane and James have been deeply involved in the Singing from Country performance at the Castlemaine State Festival where our school choir sang. Tickets for the bush dance are available through Eventbrite (https://family-bush-dance.eventbrite.com.au) or at the office. Dinner and cake will be available for sale during the evening. Get in touch if you’d like to be involved in the preparations or on the night. On the last day of school this term, all are welcome to join us for a picnic breakfast of fruit and easter bread. We’ll be starting at about 8am in the heartlands. A note will come home shortly with the details. I hope you have a wonderful Easter holidays. The office will be closed in the first week of the School Holidays – Monday 3rd April to Friday 7th April. 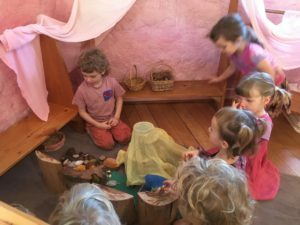 Engaging in deep play releases the potential present in every moment to transform our perspectives and being through powerful conversations. This futures-play workshop seeks to engage/release the strong internal voice needed to function in a world focused on ‘facts’, ‘future-proofing’, ‘risk-management’ and ‘strategy’. The workshop will balance movement, reflection and playfulness in order to shake up our realities and free mind, body and soul to explore and perhaps even invent new pathways to our preferred common and personal futures. The workshop is run by Dr. Jose Ramos and Dr. Marcus Bussey two playful human beings who bring decades of experience in designing and facilitating experientially rich workshops. HOUSE SIT at beautiful ECO Property near Elphinstone. MAY-JUNE. Looking for person/family to house and Pet sit for us while we’re away for all of Term 2. So getting a bit URGENT. 25acres ‘off the grid’ property, 2yr darling dog ‘Ariel’ who needs love and attention, 2 cats, 6 chooks to be fed… Our precious home is a beautiful peaceful place to be, 4 bedroom, 2 bathroom, water, vege patch, plenty of green, wifi. 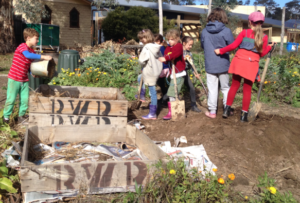 In April 2017 The Crosshatched team including Aasha Ram and the returning Manori Lal will present workshops in the beautiful food garden of The Hub Plot in Castlemaine. Crosshatched is the coming together of artists and artisans from India and Australia for creative collaborations. – Throw on a traditional wheel (assisted if needed) – Watch demonstrations of making traditional large waterpots (matka) – Decorate your own matka Tuesday 11 April 10-1pm- family workshop $130 (6 families) 2pm-5pm- indivduals $100 (8 people) Wednesday 12 April 10-1pm-indivduals $100 (8 people) 2pm-5pm- family workshop $130 (6 families) Workshop fee includes one matka.